Beneath the war paint, the blonde bombshell is a stunning natural beauty. In case you missed it, Sunday night's episode of Married At First Sight was packed with bombshells. 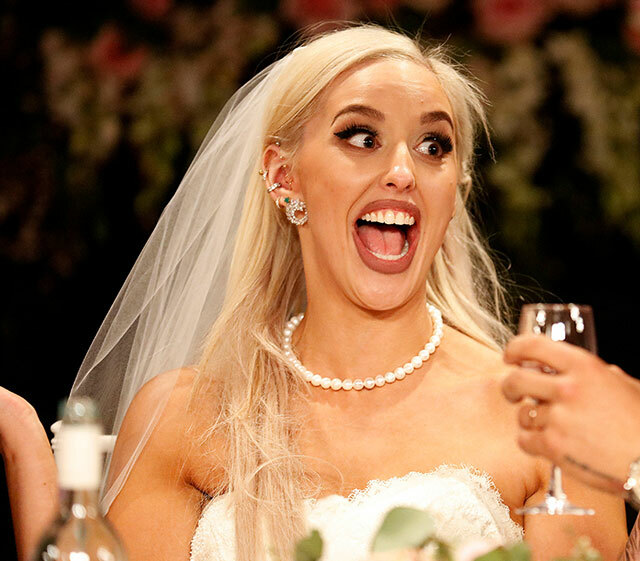 From meeting "Australia's hottest virgin" Matthew, his ensuing love story with bride Lauren, to Sam's shocking body-shaming comments over Elizabeth's appearance, it certainly wasn't lacking in the drama factor. But there was another hot topic up for discussion and that was what glamour-loving 27-year-old bride Elizabeth looked like without make-up. "I love full glam, I love to have my lashes on, hair extensions, I always like to have my nails done, I mean I love jewellery... I mean, I love it all," the sassy participant explains when we're first introduced to her. Adding: "I'm pretty glam doing every day things. Going to a fast-food restaurant, I would wear fur." Later, when the store manager is getting ready for her big day, she clashes with her make-up artist, who tries to tell her she can't have a winged eye and a big lip. But this is Elizabeth's big day and she'll do both if she damn well wants to. "The wing, the heavy lash, we'll go a pale, glossier lip, yeah?" the make-up artist asks. "Oh no! I like a certain look. It's my eyes and my lips," a bare-faced Elizabeth insists. "Normally when one is strong, you pull back on the other so your face isn't fighting for attention," the make-up artist continues to press. "I don't know what that means... you've gotta go all out," she concludes, winning the make-up battle. Before the bride proceeds to throw on a full face of make-up, complete with big eyes and big lips, viewers were given a glimpse of Elizabeth's make-up free complexion many too to Twitter to agree she actually looks better bare-faced. "What is this obsession with glamour that turns women into freakish, painted dolls? Elizabeth is so much prettier without all that make up! She does do a good one eyebrow raise though. #MAFSAU #MAFS," one user wrote. "Elizabeth actually looks like I different person without the makeup and extensions she should just leave them out and go for light makeup it would look so much better #MAFS," another added. "Elizabeth looks wayyy better without all that ott makeup. Srsly girl," a third agreed.